October is Pregnancy & Infant Loss Awareness Month. For the month of October, Carly Marie, a fellow grieving parent, is hosting an online photo essay event entitled "Capture Your Grief" through her wonderful web site CarlyMarieProjectHeal.com. "Capture Your Grief" is a 31-day photo challenge. Carly Marie has posted one topic for each day of the month of October and invites participants to share a photo and description that captures a bit of the journey as a grieving parent. It was an honour watching someone I know share and find comfort through this event last October. I hope to be able to also find comfort through sharing some of my story as Ava Faith's mom in this special way. and of utmost importance to me, to find yet another way to connect with this special child of mine and to set aside some intentional time just being her mom. 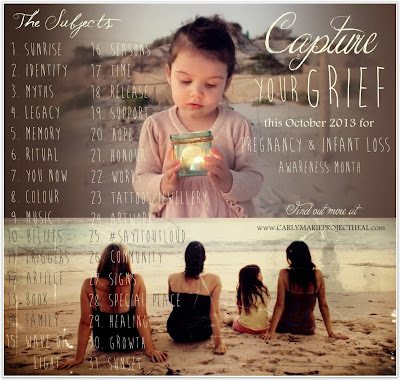 I will begin tomorrow, October 1, to walk through this project with hundreds of other grieving parents around the world through #captureyourgrief. Follow, if you wish, through my Instagram, Twitter and this blog. If you would like to participate in your own photo project, join the Facebook event or simply follow along with the list above.